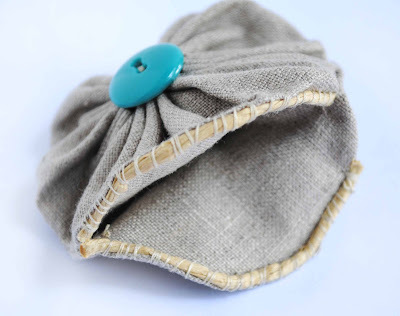 I had this idea of making a fabric yo-yo purse for a while now. With the kids back in school, I finally got a chance to sit down and test it out and it worked! It's so nice when projects turn out the way you envision them, or even better, morph into something you never expected. Either way it's always nice to see a craft concept come to life, agree? Okay on to the project, today I'm sharing how to make this fabric yo-yo purse. All you need are some basic sewing skills to whip this up in a day or less. Coin purse frame set (pictured above) - I purchased this one at Daiso. You can also find them at fabric stores and online. First you want to create two fabric yo-yo's. 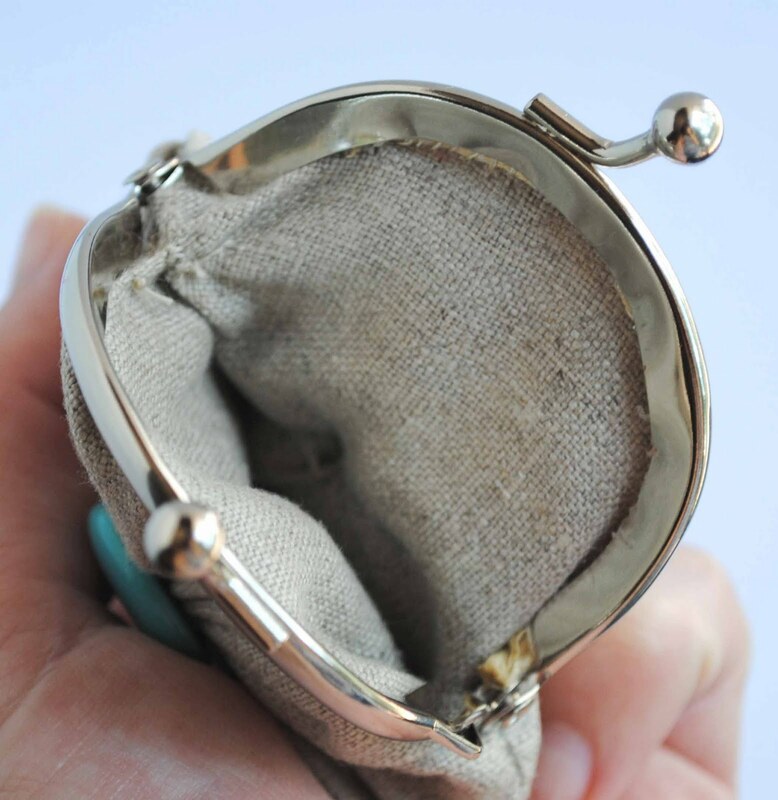 The size of your yo-yo's will depend on the size of your purse frame. Most frames come with a pattern which you can adjust the size of your yo-yo to. You can find the directions to make fabric yo-yo's here. Hand sew wrong sides together with a whip stitch where you see the blue dots. Cut raffia (will come with kit) to the length of your frame. Sew on the opening of both sides of the purse. Add glue to inside of the frame. Push fabric into the inside of the frame. Crimp the frame closed with a pair of pliers. 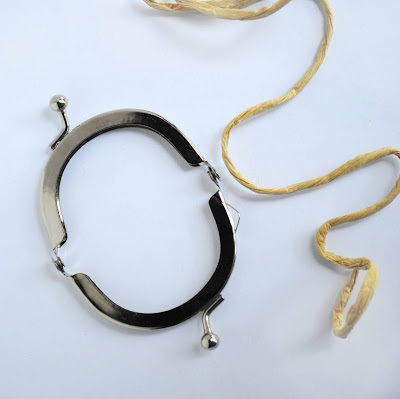 Cover frame with fabric when crimping to protect the frame. *Usually a purse frame will come with instructions similar to this tutorial. Jeepers Jessica, I think that's just about the cutest little purse ever! This is really charming, what a cool look! 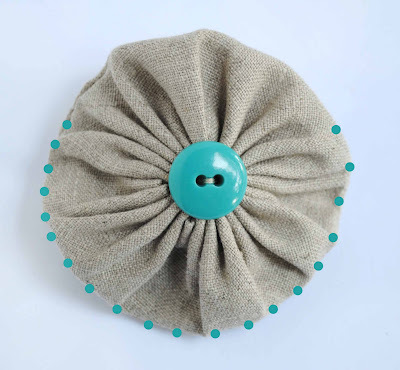 Love this idea, and since yo-yos are (so far) the only thing I can sew, perfect project for me. Thanks, J! I need to make this immediately. Oh how fun and cute!! What an inspired idea! So incredibly charming. 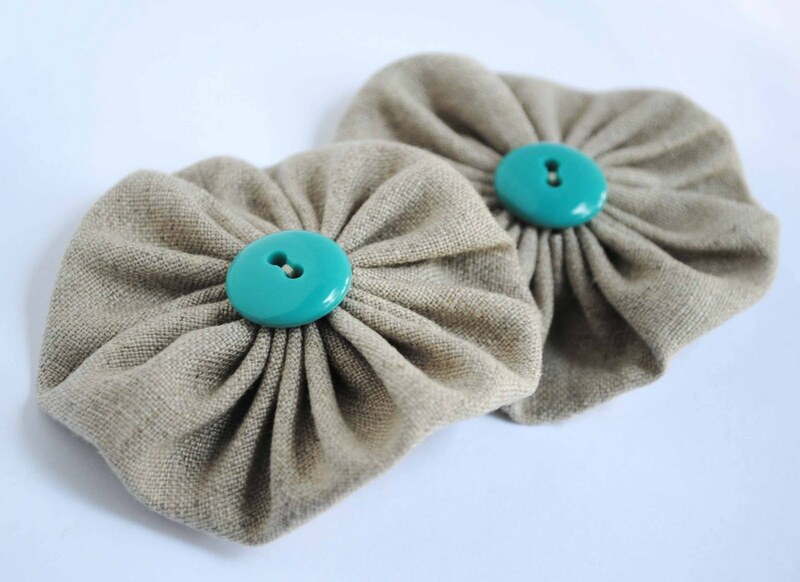 Your choice of fabric/button is just perfect too. Very cute. 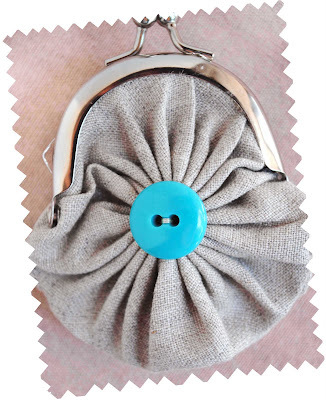 I love coin purses but haven't attempted to make one. I feel sad sometimes too that my son is in grade school, it's just time flies so fast. OMG this is so CUTE! Love it! This is adorable! I've never liked yoyos till now ;]. That is SO cute and unique!!! Yet another reason to wander the thrift shops - for little purses for their frames and/or for adding on yo-yo's! 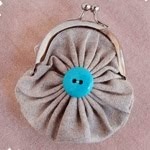 What a beautiful purse, love the colours you chose for the fabric and the button. 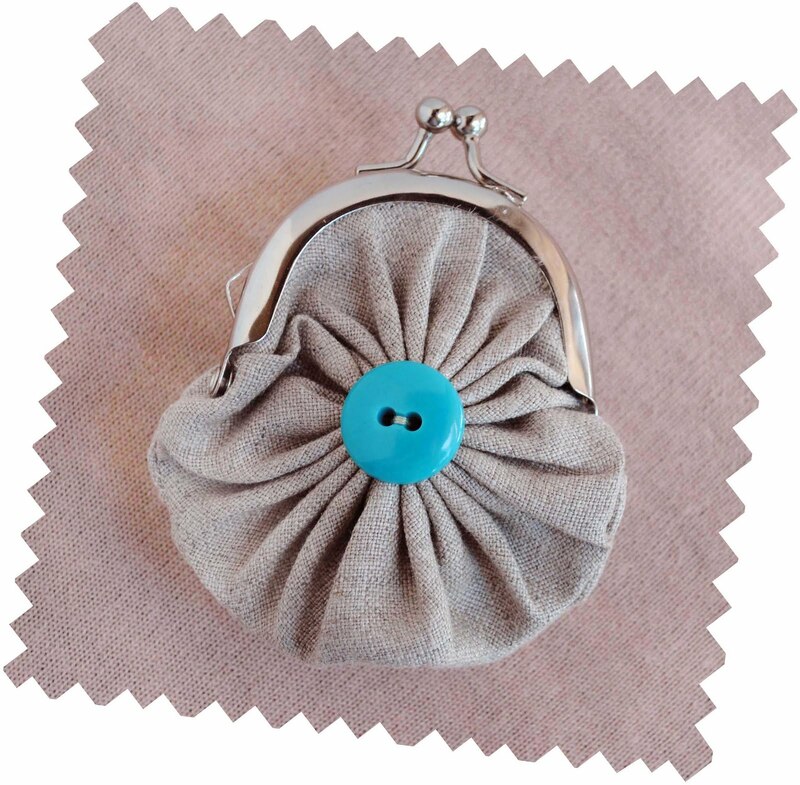 This is the cutest little coin purse! I've never used one of the frames so I must admit, it looks a little intimidating but I have to try it. Very unique idea! I think this is real creative! This is beautiful. 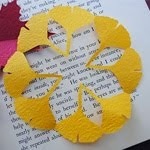 Yo-yo's are on my to-do list, but this will be up there on my top crafts to make with that technique. WOW!! great project! have been wanting to make some yo-yo's for years now, thanks for the inspiration! 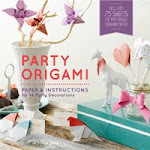 Would be so honored if you'd have a moment to drop by Craft Schooling Sunday and share this! all the best. This is fabulous! Thanks for the instruction. I can do this all day in my apartment.